Last Friday, Justin Tang and She-Ming (Shem) Lau-Chapdelaine presented their thesis seminars, taking one step closer to finishing their degrees. 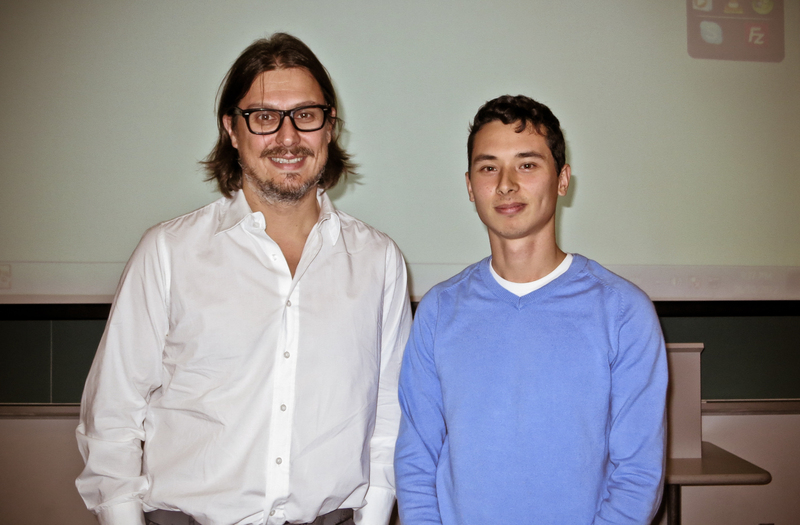 Congrats to both students and to their thesis supervisor, Dr. Matei Radulescu. She-Ming Lau-Chapdelaine’s presentation can be seen here. Justin Tang’s presentation can be seen here. 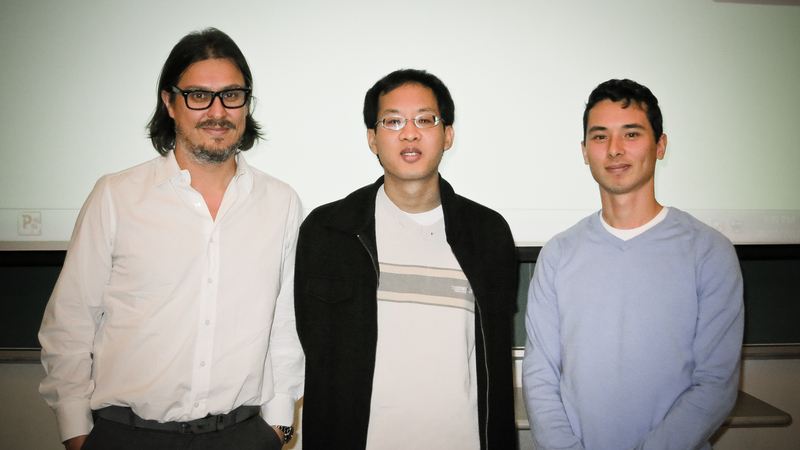 Dr. Matei Radulescu with students Justin Tang and She-Ming (Shem) Lau-Chapdelaine. 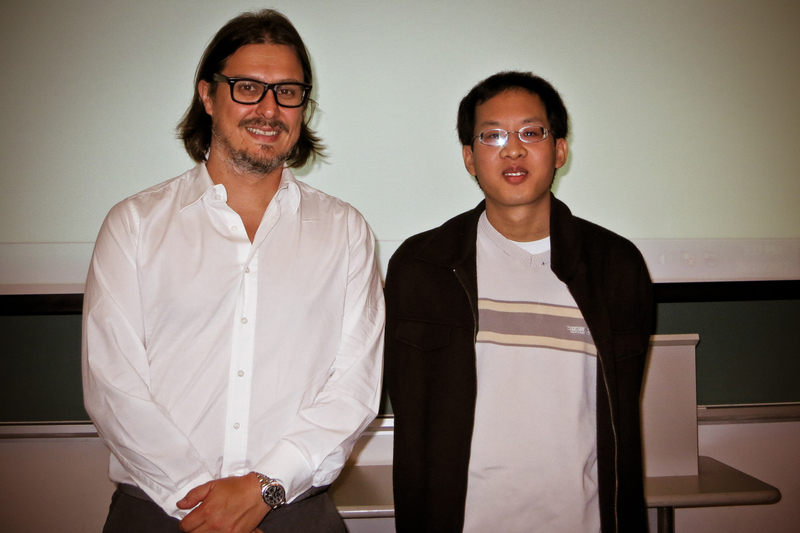 Dr. Matei Radulescu with student She-Ming (Shem) Lau-Chapdelaine. 26th October: graduate seminar double header! The seminar abstracts follow below. The present study investigates the spatiotemporal variability in the dynamics of self-sustained supersonic reaction waves propagating through an excitable medium. The model is an extension of Fickett’s detonation model with a state-dependent energy addition term. Stable and pulsating supersonic waves are predicted. With increasing sensitivity of the reaction rate, the reaction wave transits from steady propagation to stable limit cycles and eventually to chaos through the classical Feigenbaum route. The physical pulsation mechanism is explained by the coherence between internal wave motion and energy release. The results obtained clarify the physical origin of detonation wave instability in chemical detonations previously observed experimentally. Rapid chemical reactions within the detonation structure periodically create over-driven detonations. Small time and size scales involved in detonations make it difficult to determine the cause of these rapid chemical reactions. A detonation which diffracts over an obstacle is weakened by expansion of the gas. The lowered temperature behind the weakened shock wave increases the ignition time of combustion. This can lead to the decoupling of the shock and reaction fronts, essentially quenching the detonation. The detonation can be re-initiated downstream of the obstacle upon reflection off walls or planes of symmetry. This experimental setup is similar to the magnification of the detonation structure. This re-initiation phenomenon , the creation of an over-driven detonation, has previously been attributed to five possible causes of rapid reaction: shock compression from the incident and reflected shocks, shock compression from the Mach stem of the reflection, or turbulent mixing of burnt gas with the shocked, yet unburnt, gas through Kelvin-Helmholtz or Richtmyer-Meshkov instabilities or the wall-jetting effect. The precise cause of this phenomenon has, however, remained elusive and difficult to predict. This study develops a numerical model capable of predicting detonation re-initiation events. This is done by solving the two-dimensional reactive Euler equations with one-step Arrhenius chemistry. The model is calibrated with a real chemistry model by replicating the post-shock conditions. The shock compression of the Mach stem and wall-jetting effect are found to play important roles in detonation re-initiation. The pressure required for re-initiation is accurately predicted and the flow-field is found to be in good agreement with experimental results with one exception: the reflected (transverse) detonation (“super detonation”) is not reproduced in the simulations. Last Friday, Jean-Louis presented his MASc thesis seminar in the presence of his grad student colleagues and supervisor Dr. Jodoin. Afterwards, the grad students had a little social gathering and also presented a lovely parting gift to James, who is leaving us to go on to other adventures. Grad students present a parting gift to James. 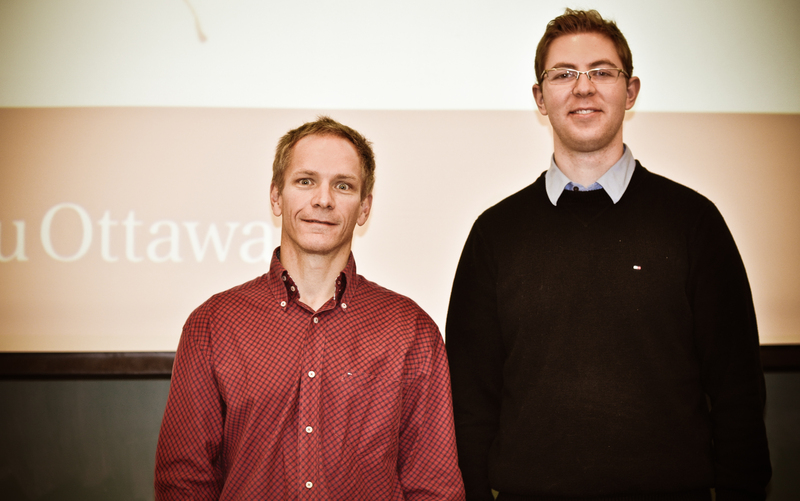 Jean-Louis Pelletier with supervisor Dr. Jodoin. 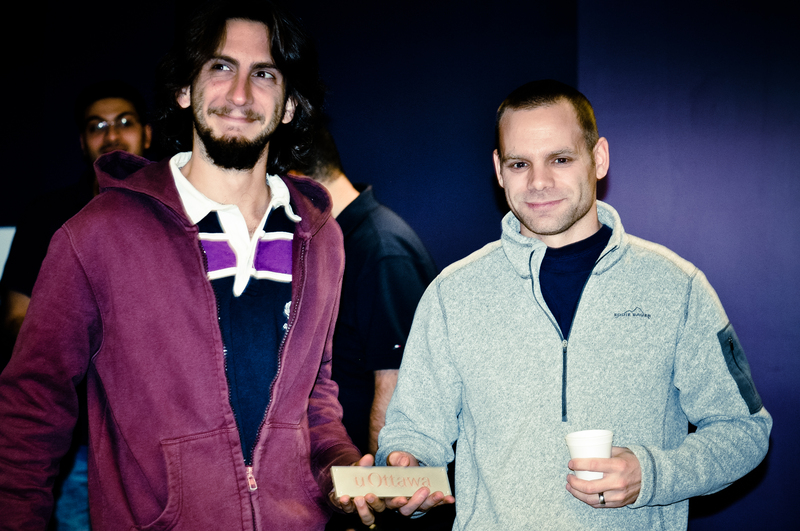 Jean-Louis Pelletier will be presenting his thesis seminar today. The abstract of his talk follows. The objective of this study is to successfully repair Ti-6Al-4V substrates by depositing Ti-6Al-4V layers using two new commercially available Cold Spray processes such as Low Pressure Cold Spray (LPCS) and Pulsed Gas Dynamic Spray (PGDS). The examination of both feedstock powder and coatings were performed by different techniques such as Optical Microscopy (OP) and Scanning Electron Microscopy (SEM). Porosity, hardness, adhesion strength, wipe test, fracture surface and wear test have been evaluated. Cold spray has shown to be a promising technique for the deposition and repair of heat sensitive particles such as titanium alloy. LPCS and PGDS both produced high quality coatings.